Prior to each performance of Amahl and the Night Visitors, Petite Opera will proudly feature a special guest artist to help set the tone for the season and the opera. These outstanding artists are active in performing throughout the Chicagoland area and beyond. 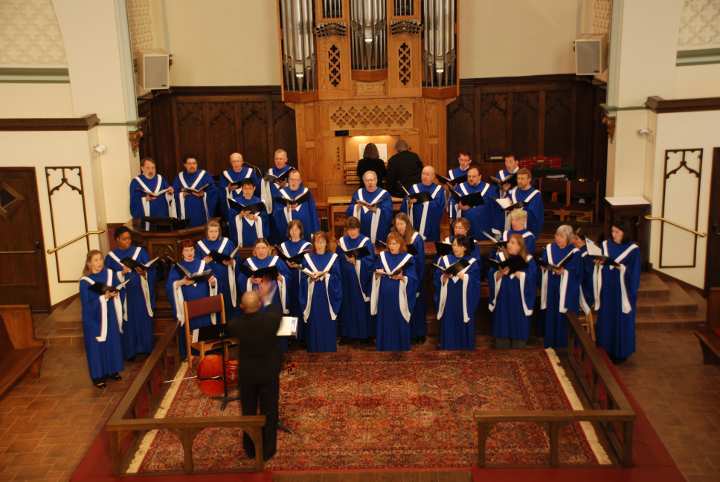 LCC is a unique sacred choral ensemble with a rich spiritual tradition and an ever-expanding repertoire. For more than sixty years, its classic a cappella style has enlightened, educated and entertained the people of Chicago--and the world. LCC was founded in 1947 as part of the centennial celebration of the Lutheran Church Missouri Synod. What began as a celebration is now a select group of performers ranging from different spiritual backgrounds who share a common desire--to make a joyful noise. LCC is committed to exploring the full universe of creative vocal expression by pursuing unique artistic challenges. 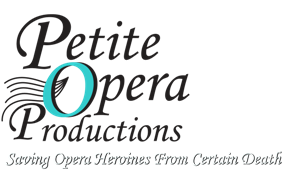 The group seeks to blend vocal talent with an array of creative disciplines, including instrumentalists, dance, other choirs, theatre troupes and opera companies, like Petite Opera. The group has produced several CDs and videos for public broadcast and has toured in Scandinavia, Austria, Slovakia and Hungary. Whether performing from the front a a church or on center-stage, LCC presents a wide range of styles and compositions with a spirit that is contagious. The group is led by Artistic Director Wilbert O. Watkins, who continues to bring Lutheran Choir of Chicago his wealth of knowledge and experience. Dr. Watkins is the founding artistic director for a not-for-profit organization known as Sing to Live Community Chorus, which provides a musical outlet for women and men touched either directly or indirectly by breast cancer. His past Midwestern conducting experience has included director of the mixed chorus Unison with the Windy City Performing Arts in Chicago; visiting assistant professor of music education at Northern Illinois University; adjunct faculty at DePaul University; Director of Choral Activities at Clark Activities at Clarke College in Dubuque, Iowa, where he was the originator of the Multicultural choral series; and director of the Dubuque Area Men's Chorus. Having taught as both a choral musical educator and an applied voice teacher in Texas, Florida, Iowa and Illinois, Dr. Watkins currently teaches voice privately, serves Pilgrim Congregational Church in Oak Park, and has been involved in several volunteer community efforts. On December 2, LCC will present the Advent/Christmas Concert Hodie! The concert will be held at a venue in Franklin Park on Dec 3 and Chicago on December 4. Visit the group online at www.lutheranchoirofchicago.org for information about upcoming engagements and locations. An award-winning magician, The Great Frankini (Frank J. Glab) has performed around the world, including Japan and Egypt. He gave his first magic show at the age of eight and his love and enthusiasm of magic has been going strong ever since. His collection of magical apparatus, many of which are of his own making and design, combined with his manual dexterous skill, make his show quite a delight for both younger and more mature audiences. Studying theatre in college, as well as continuing work in Chicago area theatre and opera, has greatly enhanced his ability to present Frank studied theatre in college, as well as continued to work in Chicago area theatre and opera has greatly enhanced his ability to present magical effects in an entertaining manner. Frankini has a Masters in Fine Arts in voice from North Eastern Illinois University. Some of his effects are as small as an imaginary deck of cards. Others are as large as sawing a lady in half. 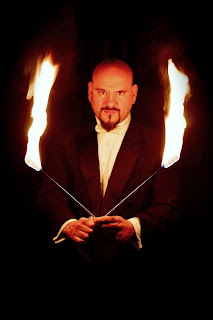 He is able to present astounding feats like fire, levitation, and ESP effects that will convince patrons he is reading their mind. No matter the size, all of his effects pack an amazing wallop. A real Renaissance man, hie performances are bursting with creativity and fun. He is a truly magical entertainer patrons will be delighted to see, and will not soon forget. The Great Frankini lends additional magic to Petite Opera's concept for Amahl and the Night Visitors, which immediately follows his act, as both explore the Magic.--The Great Frankini in the visual sense, and the Three Magi in the spiritual sense. Don't miss this wonderful featured artist. On Saturday evening, December 3, and again on December 11 at 4:00 PM, Musicke's Merrie Companions will present a program of early music on Recorder and Krumhorn. This small performing consort is comprised of instrumentalists who are also members of the Oak Park Recorder Society. For over 27 years, the group has played at the Bristol Renaissance Faire as well as for private engagements such as Birthdays, Bar Mitzvas, Weddings, Banquets, or any other gala affair. The Oak Park Recorder Society is the place to come if you have a recorder and would like to play regularly with others. OPRS has been bringing recorder and "Early Music" enthusiasts together for over 40 years. There are also chances to present our sounds to others. The group plays for church services, before Shakespeare plays, school demonstrations and even at Brookfield Zoo's "Holiday Magic." OPRS meets every Tuesday evening at Pilgram Church, 460 Lake Street in Oak Park. Patrons are encouraged to check out the group to play or listen. For more information about Musicke's Merrie Companions or the Oak Park Recorder Society, contact Director, Nancy Chabala at 708 442-6053. For those unfamiliar with recorders and krumhorns, here's a brief description of the various types. Recorders are a family of end-blown duct flutes with a thumb and 7 finger holes. There are eight sizes - Garklein, Sopanino. Soprano, Alto, Tenor, Bass, Great Bass and Contra Bass. The most common are Soprano, Alto, Tenor and Bass. MMC will be playing all of these instruments during its Petite Opera featured artist concerts, with the exception of the Garklein. At various times the recorder has been called a `fipple flute', an `English flute' and the common flute. The Italians called it the flauto dolce (sweet flute), the French, flute (flute with a beak) and the Germans, blockflote (block flute) referring to the block of wood in the head joint which directs the air. The recorder was the flute of the period (13th C to early 18th C) while what we know as the flute today transitioned from the transverso or transverse flute. When Purcell, Bach, Handel and Telemann wrote flute parts, they had the recorder in mind. Recorders fell out of use in the early 18th C because the transverse flute was louder and capable of more expression. Krumhorn are double-reed instrument with a wind-cap so that the reeds are not exposed. It is curved on the bottom end. Both of these features made krumhorns one of the most common reed instruments from the late 15th C to the early 17th C. They were easy to play on horseback and while riding in music carts without the damage to the mouth that an exposed reed could cause. Like most Renaissance instrument, krumhorns were made in families. The sizes commonly found today are the Soprano, Alto, Tenor and Bass. Krumhorns fell into disuse due to taste changes and their limited range of only 9 notes. Today, the closest relative to a krumhorn is a bagpipe. During Amahl and the Night Visitors, Amahl plays a recorder typical of the period. 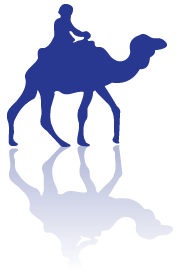 Musicke's Merrie Companions presents early music that would be representative of what we would think Amahl might have played. Don't miss this wonderful chance to hear this wonderful ensemble.